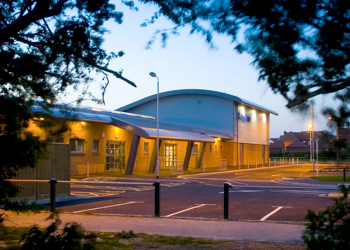 The Selsey Centre was a joint project between Selsey Town Council and Chichester District council, opening it's doors in April 2007. It is conveniently situated in Manor Road, Selsey adjacent to the award winning Manor Green Park. The entire centre is wheelchair friendly with disabled WC and shower facilities; the well-marked and lit car park has 43 spaces and includes 3 dedicated disabled bays. All facilities are available for hire by individuals groups, organisations and for business purposes. Our reception area is open on Mondays to Fridays from 9am to to 5pm, on occasions it is also open in the evenings when activities are taking place at the centre. The centre has a premises licence from 7.30am until 11pm each day with restrictions on certain activities at weekends. It consists of three main rooms, a Conference Room, Dance Studio & Multi Use Sports Hall. The latter two can be converted into one room large named the Selsey Arena. There is also a Kitchen, WC's and Changing Rooms. To make a booking you can complete the form below, please read the full terms and conditions; alternatively call the Centre on 01243 603836 for more information.